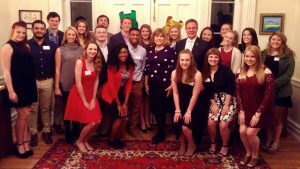 On February 7, 2017, Chancellor and Mrs. Vitter hosted the OMWC and scholars for the Red Plate Supper at Carrier House. As the month of February brings love into the air, the Vitters shared what they cherish in each other, to live life to the fullest. “What really impressed me about Sharon is that she is great in every respect. She makes everything happen, as we are a real team,” said the Chancellor. “He has a gift to see a bigger picture of where the University of Mississippi needs to go,” said Mrs. Vitter. The couple has three children, Jillian, Scott, and Audrey. Although their children did not attend the event, the words spoken by Chancellor and Mrs. Vitter were those of two proud parents. In August, the Vitters will celebrate 35 years of marriage. They also shared their journey moving to Oxford, the impact the University has made on their lives, and words of encouragement to the scholars to take the opportunity to study abroad.